This week our friends Christa and Candy are over from Cape Town (all nicely alliterative) so we treated ourselves to dinner at Hakkasan. The first one of this now global restaurant brand was in Hanway Place behind the back of Tottenham Court Road Station and it opened in 2001. 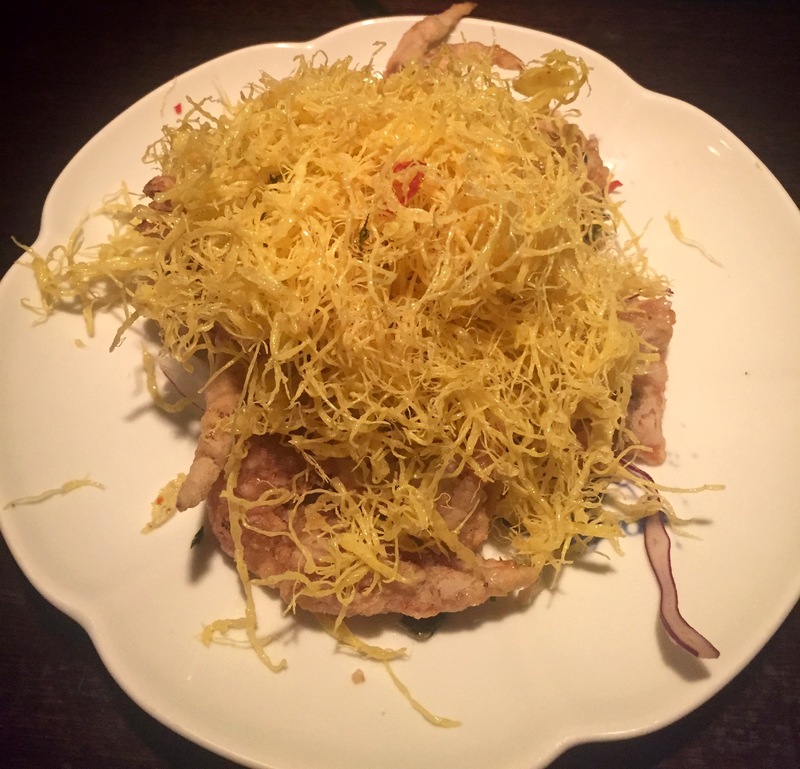 I remember going to try this new style of contemporary Cantonese Chinese food with great excitement. With its darkened staircase, intricate wooden screens and modern decor (not to mention the toilets which soon became a London legend) Hakkasan was certainly like no other Chinese restaurant I’d ever been to. Now there are multiple branches of the Hakkasan brand in India, the Middle East, USA and China and there’s a second one in London’s Mayfair which opened in 2010 and was awarded a Michelin Star in 2011 which it’s held on to since. This is where we’re heading for tonight. You inhale that unique Hakkasan vibe which becomes mixed with a sense of excitement as you pore over the menu. I think it’s fair to say that we got all a bit over-excited and ordered what turned out to be a serious amount of food – sadly way more than we could consume. Lesson learned – the portion sizes are extremely generous – you don’t need to order nearly as much as you think. My starter was the best soft shelled crab I’ve ever eaten. Piping hot, light and crispy with the beautiful sweet and tender crab meat completing a fabulous combo of flavours and textures. I’d go back just for this. 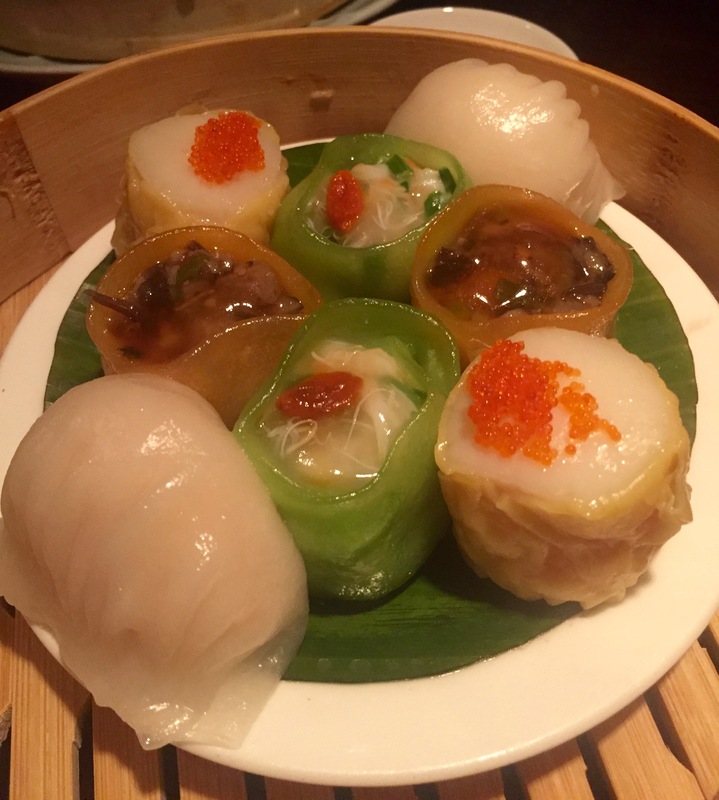 And how’s this for a substantial helping of glossy dim sum – yes, this is one portion!? Fillings of prawn, crab, scallop and duck made for a tasty collection. 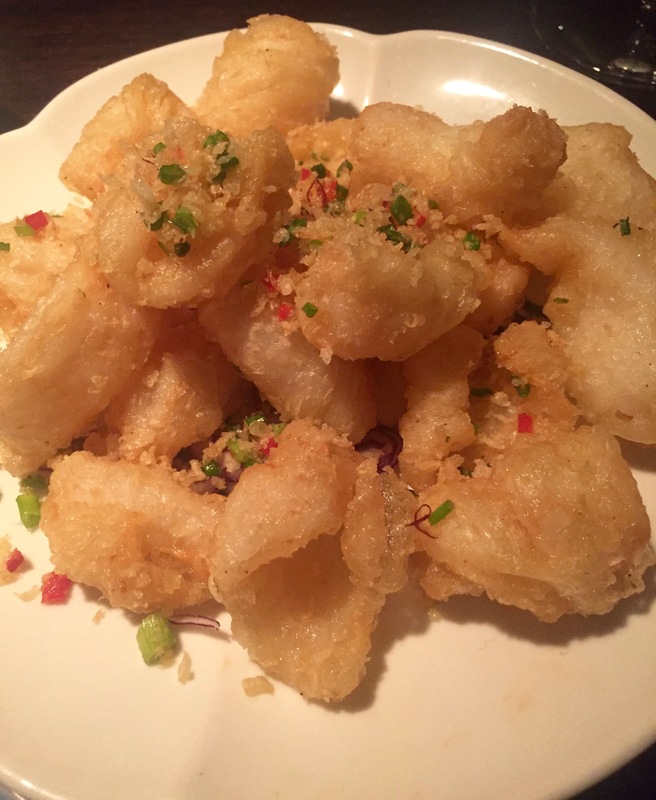 Salt and pepper squid was crispy on the outside and softly sweet inside. It’s fair to say those starters pretty much sated our appetites! They were seriously substantial and I’d advise sharing one between two (or more). And that’s before even seeing what we had in store for our mains. The steak cooked in Merlot came in a crispy noodle net. 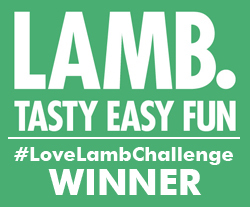 It was wonderfully tender with great depth of flavour in its glossy sauce. 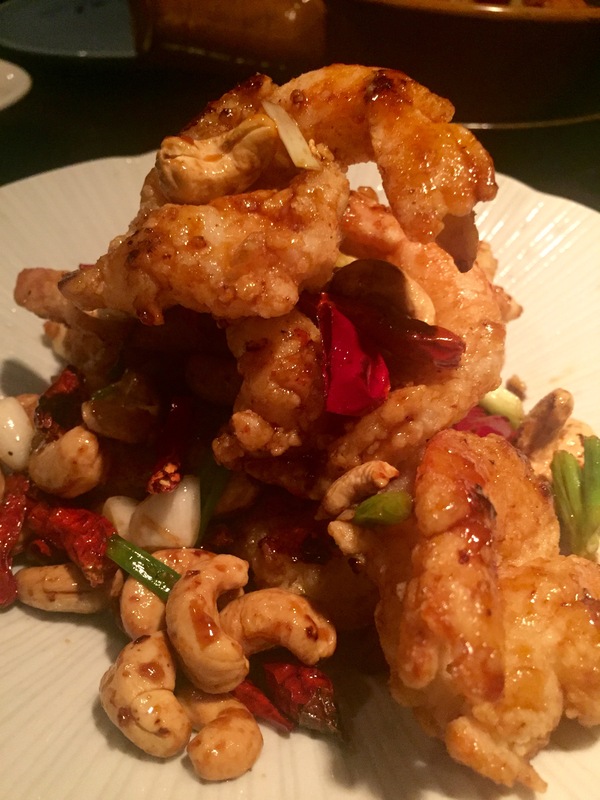 And then there was this tower of spicy prawns served with cashew nuts. I don’t think I’ve ever seen so many large prawns in a portion. 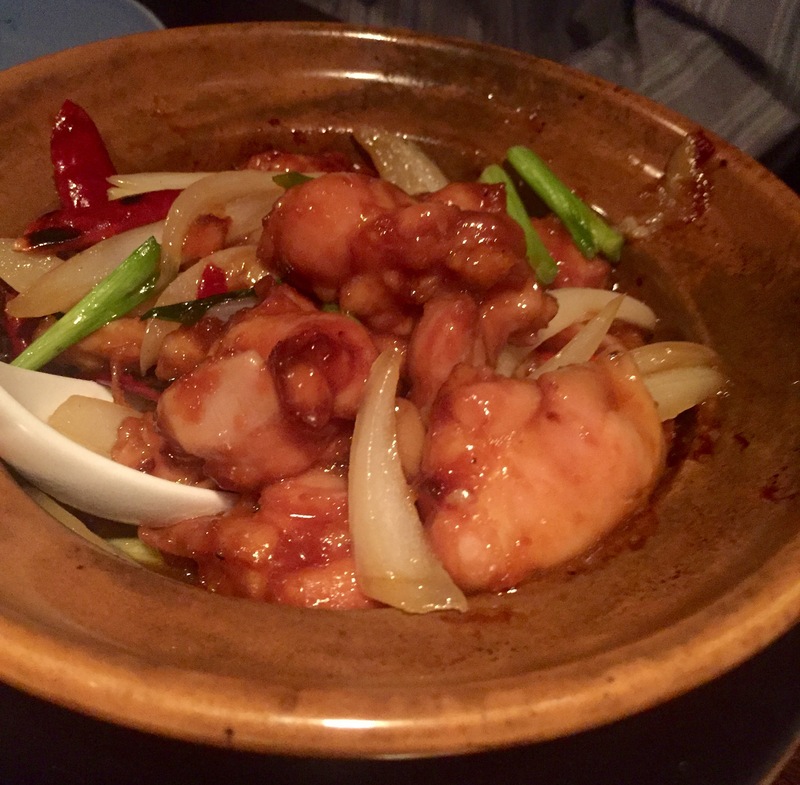 The Sansei chicken clay pot came in a traditionally tasty sauce of sweet basil, chilli and spring onion. 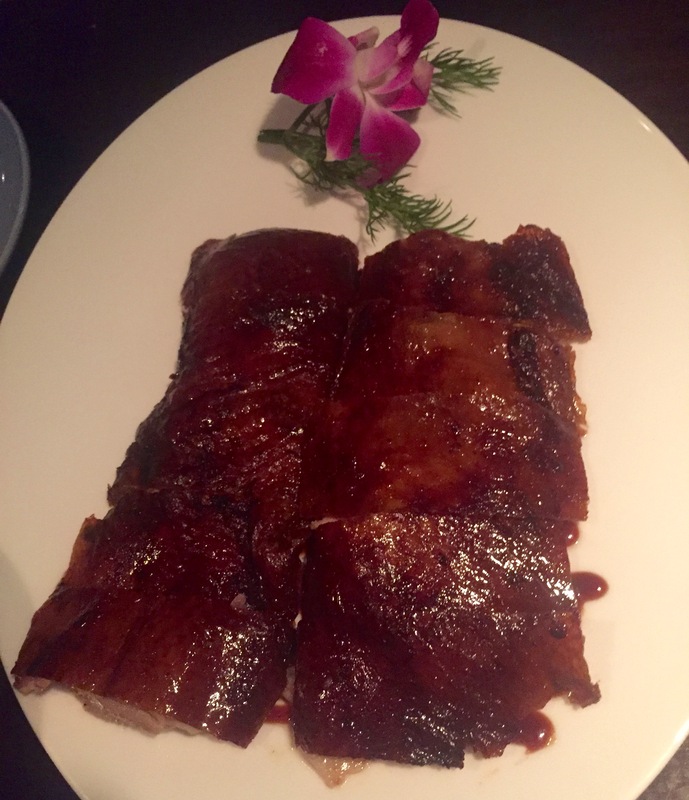 Our final choice was a plate of crispy duck, all pared down and laid out perfectly for easy consumption. Certainly a rich dish, but you’ve gotta love that crunch. Okay that was a serious lot of food. 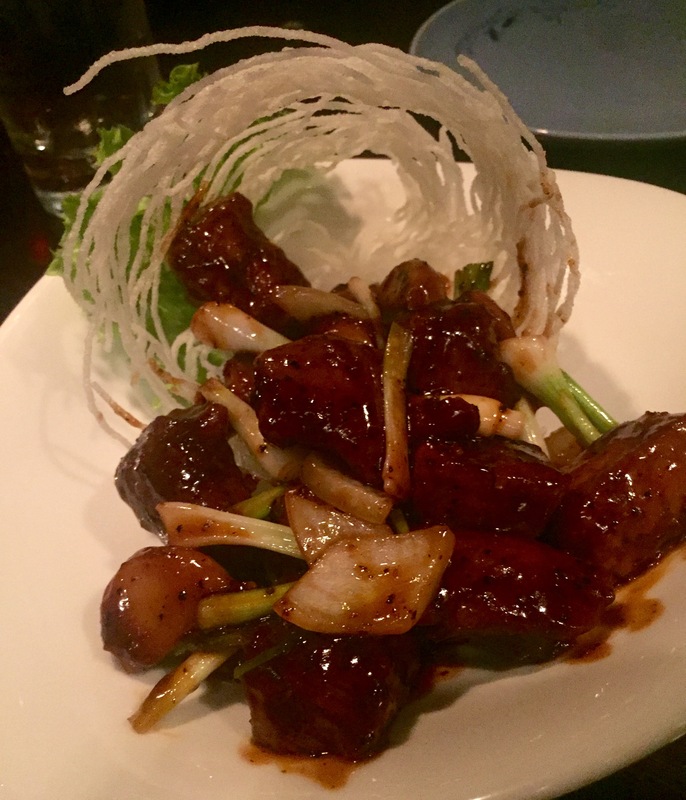 Hakkasan makes for an expensive night out but we realised we could probably have ordered half and still left fully satisfied (and obviously with a smaller bill to pay). And something else to bear in mind is that Hakkasan is a slickly-oiled machine that operates full speed ahead. You’re given your two-hour dining slot and at times it feels like the staff are on bonuses to see how much under two hours they can get you out in. All that food arriving so rapidly can make the experience a little intimidating – you feel a bit like you’re dining on fast forward. But it’s still a wonderful experience with truly delicious food. I just wish it had lasted a bit longer. Hakkasan is at 17 Bruton Street, Mayfair, just off Berkley Square.